Finding the best converter for HD video is always a challenge. If a converter changes the video quality to the poor condition then selecting such a video converter is not a wise choice. Although, the secure conversion of files is demanded by the users and FREE usage is a great bonus with it. However, you can convert the video files in many ways using various online and offline tools. But, for the large files, you should try Wonderfox HD Video Converter Factory Pro at first which will fulfil all of your expectations including secure video converting, HD video to MP4 or to other formats, SD video to HD resolution and to iPhone video formats also. There are more than 400 video formats available in Wonderfox video converter to convert a file. You can select any format to convert your files as per your choice. WonderFox Video Converter PRO is the ultimate converter tool which can easily convert all types of files to any other formats keeping the video quality same. Just you need to download the full version of WonderFox HD Video Converter PRO on your PC. Don't worry. You will get it Free to download and run. However, you can run the offline installer as well. Let's review this tool with its features and procedure of converting any files. WonderFox HD Video Converter is the best converter for any video formats. This software can convert any video to other formats easily. WonderFox does the job of uploading a file very quick which is an attractive feature of this tool. This tool minimizes the size of a video up to 5x times after converting keeping the same video quality. WonderFox HD Video Converter Factory Pro uses an advanced technology for converting SD video to HD resolution video easily. The High-Definition video conversion technology is very much advanced on WonderFox which you should try must. WonderFox Video Converter Factory Pro, the fastest video converter provides the option to convert multiple files (up to 10 videos) at a time. This tool can upload and convert large videos files in few minutes. If you need best professional video converter then WonderFox offers this amazing tool. The best thing is this tool is not only a video converting tool. With WonderFox HD Video Converter Factory Pro, you can cut, edit a particular video easily by its many tools present in the software. This tool can merge, crop or remove a blank portion from a video easily by its tools. Also, can add effects to the videos. WonderFox supports over 400 video formats to convert on 300+ devices. This tool converts a video to perfectly fit on the screen. WonderFox can also convert an MKV video file to Samsung TV video format easily. At first, download the software and install on your PC. 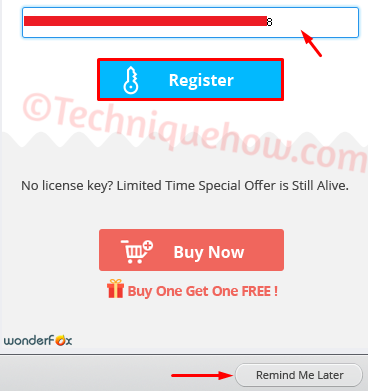 Now, put the license key if you have any or click 'Remind Me Later'. (Skipping the registration may exclude some features from that software). Then, convert window will open. Just add a file by clicking on the down-arrow under 'Add Files' option. Once you have selected, just click on 'Run'. It will start to convert the file and will complete the process very quickly. You can also change the output folder to save the file after the convert is complete. Just click on 'Open Folder' and select a new folder to change the path. This is the best tool to convert a file in less time. WonderFox can convert HD video to MP3 or other formats and also SD video to HD resolution which is possible by its advanced technology. Just install the WonderFox HD Video Converter Factory Pro and give a try for. You can purchase the license key if want to enjoy more features.